First of all, let me start by saying that the poster above is one of the coolest movie posters of all time. 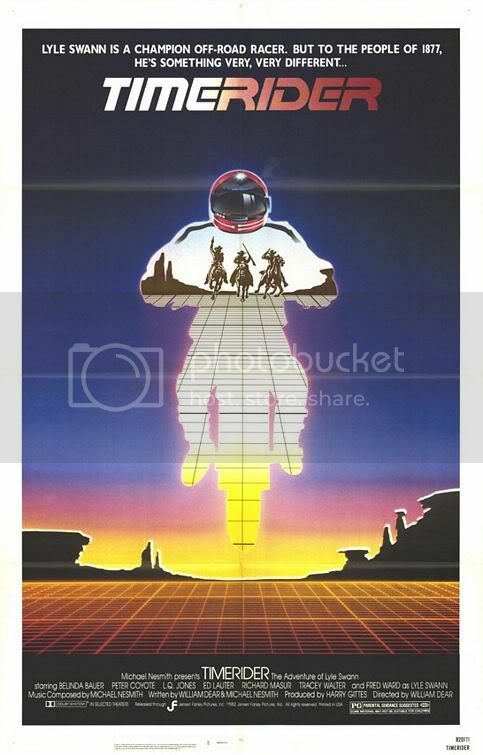 I love 80s movies, especially Sci-Fi so this poster makes me salivate. Well, after years of wanting to see Timerider, I finally did. I knew the film was about time travel (even better) but was a little disappointed when I found out that the main character goes back in time (early 1900's) instead of into the future. I was kind of hoping for a "Last Starfighter-type" 80s Sci-Fi flick but I didn't really get what I was hoping for. Timerider: The Adventure of Lyle Swann stars Fred Ward as the lead character. Swann is a very skilled motorcycle racer with some high tech gear but he refuses to go professional. Swann takes off on his bike after a race and accidentally ends up on the receiving end of a time traveling beam that is being tested secretly in the desert. Swann is sent back in time to the year 1877 and must fight off a murderous gang, led by E.T. 's Peter Coyote, who wants to steal his "machine" while also trying to get back home. Luckily, he has a priest (Ed Lauter), a beautiful young woman (Belinda Bauer) and LQ Jones on his side. Timerider is one of those films that probably would have been great if I had seen it when it first came out as a kid in the 80s (as I did The Last Starfighter). It would have been hard c0nsidering I was only two years old, but you know what I mean. Seeing it now, it just seems very dated. I still liked the movie though. It wasn't overlong and the film had a great cast. Though I never thought of Fred Ward as much of a leading man, he does an adequate job here. Another thing I liked about the film was the great rockin' soundtrack by Michael Nesmith of the Monkees (who also co-wrote and produced Timerider). The film is also blessed with a make it or break it ending that is actually very smart and unexpected. So despite its flaws, Timerider was definitely worth a watch. Though released on DVD in 2001 by Anchor Bay Entertainment, the DVD is currently out of print but the great Shout! Factory is re-releasing it on Blu Ray on March 19th 2013! Pre-Order it HERE .